Check out this preview of a great couple!! I met them for engagement shots in Philly yesterday. It was a bit of a challenge fighting the tourists for some of the shots we wanted, but we got what we needed as we walked the City a bit. We had a great time, and I look forward to the wedding in April!! Congrats Lori and Tommy – you guys are awesome!! I was told it was love at first sight. Walking right down the middle of the Ben Franklin Parkway!! Three weeks in Israel was indeed the trip of a life-time (so far…cause it’s far from over!). It was amazing to be exposed to such a variety of cultural, religious and historic experiences in one place. If you’ve spent any time reading my previous entries I am sure that you have a flavor for that. I must admit, however, that the one aspect of this experience that left me wanting for something different was the food. I love hummus and falafel. The fresh tomato and cucumber salad was great. There was an abundance of water melon, which in and of itself is amazing given the fact that they are grown in the desert…how’s that for an oxymoron? But here’s the thing…there’s only so much of that stuff that one guy can take. Bring on a juicy cheeseburger, a meat lover’s pizza, or a cheese steak!!! 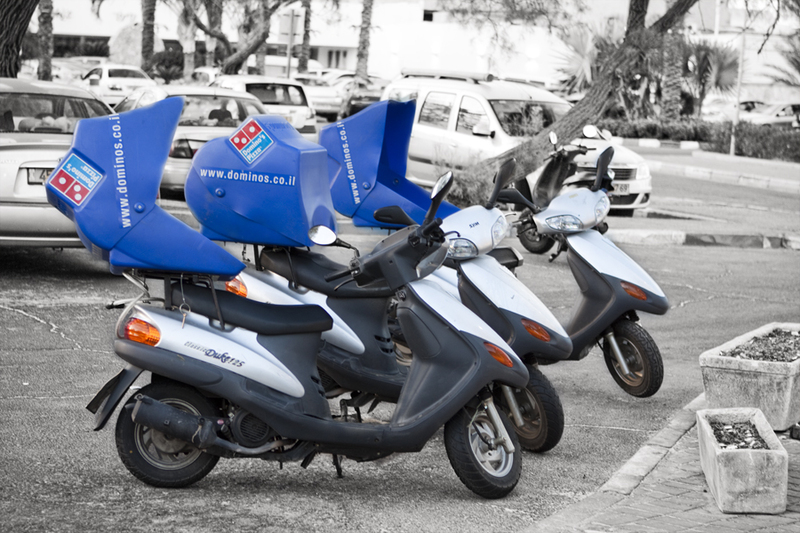 Ooops, that stuff’s not kosher…not gonna find it where we were…even though you may find a Domino’s Pizza (that’s what it says in Hebrew in the sign under the word Pizza), and they do deliver!! So, having returned to the United States, I am sure you can appreciate the fact that my culinary mindset was to immediately seek out the fattiest, greasiest, most mouthwatering combinations of meat and dairy that one could put on a plate. I live in the greater Philadelphia area, so it makes sense that I would seek out one of the many outstanding Philly cheese steak establishments to satisfy that craving. Little did I know that my yearning would lead me right into a controversy that has permeated the Philly media, and that directly relates to some of the sentiments I had expressed during that trip…particularly related to tolerance and cultural differences. Joey Vento, the founder and owner of Geno’s Steaks (photo below), a Philly landmark for the past 40 years, has implemented a policy under which patrons will not be served unless they order in English. There are two signs posted by the counter indicating that policy, and Mr. Vento has recently purchased radio advertising time expressing his belief that English should be the official language of the United States to such a degree that as a business in America he should only cater to those who can purchase his product in English. Radio ads? Really? He is not a politician vying for an elected position. He’s a cheese steak guy about whom I wonder whether or not he knows how long it took his ancestors to learn English when they arrived in this great country from Italy? Just as I did when I was in Israel, let me give you some cultural and geographical perspective on this issue. Here in Philadelphia and the greater Delaware Valley we refer to the genre of food characterized by a long tubular shaped roll filled with any variety of meats, cold cuts, luncheon salads, condiments and other toppings and garnishes as a hoagie. Those of you reading this from other parts of the world may otherwise know them as subs, submarine sandwiches, torpedoes, grinders, heroes, poor boys, and even pigboats. The epicenter of all things cheese steak hoagies can be found at the intersection of 9th Street and Passyunk Avenues in South Philly, where Geno’s Steaks sits across the street from Pat’s King of Steaks. Loyalists of each are as steadfast as fans of icons like deep dish or thin crust pizza, the Red Sox or the Yankees, “tastes great” or “less filling”, and Donald or Daffy Duck. Debates about the thickness of the steak, the tenderness of the onions, the doughiness of the rolls and even the vocabulary with which one orders are hotly contested issues between the two camps. Not being a Philly native, I can say that I like both. However, based upon Vento’s very public campaign allegedly based upon patriotism and Americanism, I will choose to get my cheese steaks at Pat’s. At the root of his platform is the argument that US immigration laws are too relaxed, and that our country is in the midst of a crisis. While at some level I agree that this overall issue needs reform and must be looked at very closely to ensure that we maintain our national well being, but also remain true to the very roots of our country’s creation. There is no easy answer and regardless of the direction we head there will be those who, like the cheese steak loyalists in Philly, will choose to believe that they are right. However, I believe that Vento has lost sight of what makes the United States of America great. It’s all about tolerance. Let me pose this to you…when I was in Israel, knowing that falafel was as ubiquitous as the cheese steak is to Philly, I sought out the best. 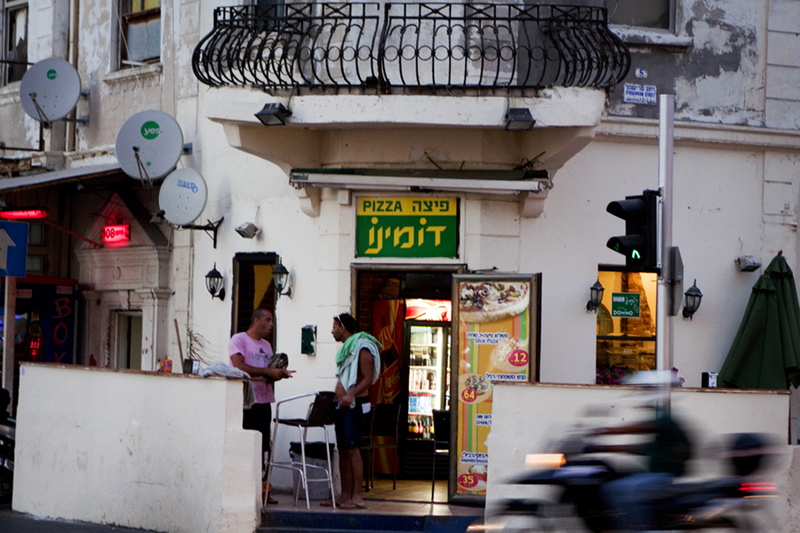 Whether we were in Yavne’el, Jerusalem, Tel Aviv, or some other village along our travels, I would ask the location of the best falafel stand….remember, I don’t speak Hebrew. When we would arrive at the local restaurant, our waiter would provide us with both a menu as well as an explanation…in English!! Sometimes it was broken, and would come with an apology. I would respond with my gratitude and the retort that the server’s broken English was far better than my lame attempt at Hebrew. The point is that I got served…with a welcome smile! Now…if an Israeli, in particular one who did not speak English, were to hop a plane, take the 12 hour journey to Philly, grab a cab to Geno’s, he would not be able to eat there. Not because of the laws of a kosher diet, but because Joey Vento requires that all orders be placed in English and refuses to serve those who cannot comply. I believe that English should be the official language of the United States, and I believe that all US citizens ought to learn the language. However, I also know that there people from all over the world who come here…some to plant roots and some as tourists, who will have great difficulty with that. Philadelphia was the center of our countries struggle for independence…a struggle which began beause of persecution and a lack of tolerance. Has Mr. Vento forgotton that…might I suggest that he make a visit to Independence Hall and the Constitution Center, which are both located within 3 miles of Geno’s. Philadelphia is a tourist destination known as the City of Brotherly Love. 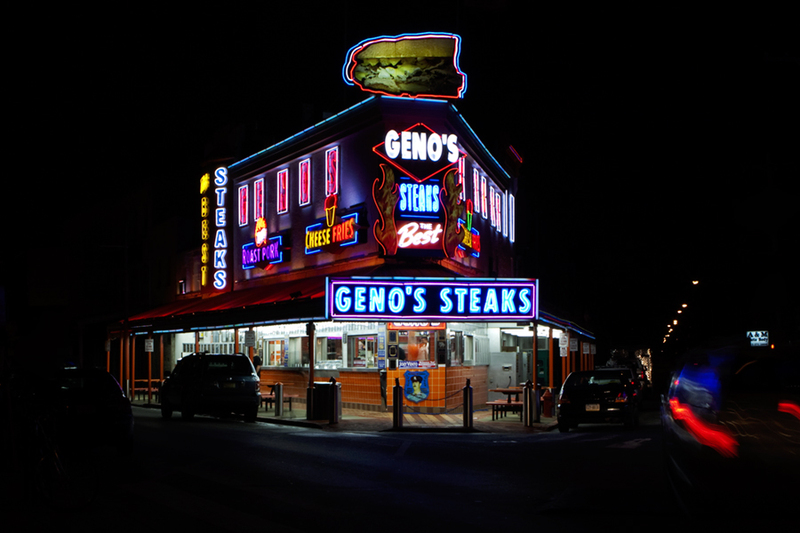 Geno’s Steaks is an iconic landmark to locals and tourists alike. Regardless of their native tongue, the people who have ordered hoagies at Geno’s over the past 40 years have arguably made Mr. Vento a very rich man. I hope that some day he uses some of his riches to travel the world. In so doing I also hope that he finds himself in one of the worlds amazing destinations where his spoken English is not the accepted language nor does he speak the local dialect. I predict that when this happens, and he hungers for a meal after a long day of touring, that he will be able to find a restaurant that will take his order and serve his food…with a welcome smile. In the meantime, if you’re considering a trip to Philadelphia, I urge you to consider indulging yourself in one of the amazing Philly cheese steaks that you’ll find here…I also urge you, when you’re in that neighborhood, to head to the hoagie shop on the other side of the intersection.